Obesity in pregnant mares can increase the risk of health problems in their offspring, including a higher chance of transient bone development problems, researchers have found. The study team said their findings highlight the importance of maintaining mares at optimal weight during pregnancy. The study team in France found that maternal obesity not only increased insulin resistance and caused low-grade inflammation in their young, but increased the chances of osteochondrosis in yearlings up to 18 months of age, at which point monitoring ended. Osteochonrosis is a bone development disorder that affects mainly joint cartilage, but prolonged changes can disturb bone contours and longitudinal growth. Damage to joint surfaces may progress to cartilage flaps being formed or fragments can break off. Pascale Chavatte-Palmer and her colleagues, writing in the open-access peer-reviewed journal PLOS ONE, said obesity was a growing concern in horses. Surveys in Europe, North America, Australia and New-Zealand variously indicate that 2% to 72% of horses are considered overweight and 1 to 19% are considered obese, with results varying depending on country, use of horses and season. The lowest incidence is generally seen in athletic horses involved in competition. “It has also been shown that horse owners consistently underestimate the body condition of their horses,” the researchers noted. Obesity in horses has been linked to problems such as the equine metabolic syndrome, insulin resistance, alterations in fat-tissue endocrine function, low-grade inflammation and laminitis. The study team, from a range of French institutions, set out to learn more about the effects of maternal obesity, using horses at the Institut Français du Cheval et de l’Equitation experimental farm in Chamberet. Twenty-four mares were enrolled in the study, separated into two groups based on their body scores. Ten mares with normal body scores were placed in one group, while the other 14, rated as obese, were placed in the second group. Throughout their pregnancies their body condition scores were monitored, with regular checks conducted on their concentrations of plasma glucose, insulin, triglyceride, urea, non-esterified fatty acid, serum amyloid A (which can be an indicator of inflammation), leptin and adiponectin. After 300 days of pregnancy, an intravenous glucose tolerance test was performed. The resulting foals were monitored for the first 18 months of their lives, with regular measurements taken of their plasma serum amyloid A, leptin, adiponectin, triiodothyronine, thyroxine and cortisol concentrations. At 6, 12 and 18 months of age, glucose tolerance tests were undertaken and bone-joint examinations performed. Throughout the experiment, maternal body condition scores remained higher in the obese group of mares compared to the normal mares. During pregnancy, plasma urea and adiponectin were decreased and serum amyloid A and leptin was found to be higher in the obese mares. “Obese mares were also more insulin resistant than normal mares,” they reported. There was no difference in offspring growth between the groups. However, plasma serum amyloid A concentrations were increased in foals from the obese mothers compared to the foals from mothers of normal weight until six months of age. The foals from obese mothers were consistently more insulin resistant. 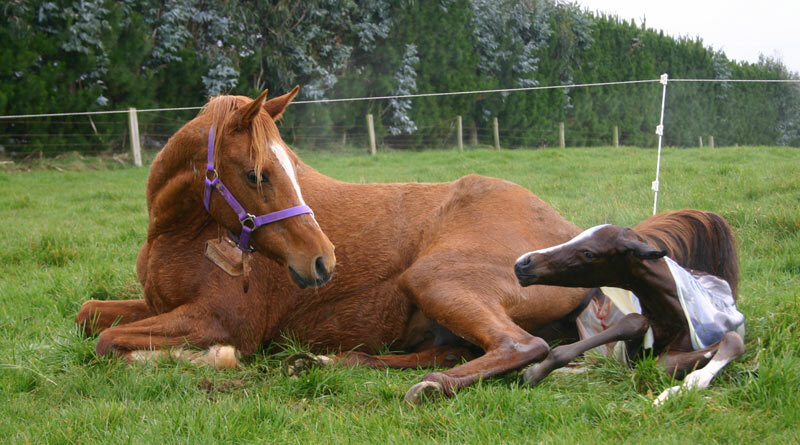 At 12 months of age, foals from the obese mares were significantly more affected by osteochondrosis than those from the mothers of a healthy weight. “Maternal obesity altered metabolism and increased low-grade inflammation in both dams and foals,” they concluded. The obese mares were characterized by an increased fat mass during two consecutive years, even though they were fed the same quantity and quality of feed as normal mares. They had altered carbohydrate and nitrogen metabolism, which is commonly seen with obesity, and had increased low-grade inflammation during the second half of their pregnancies. Broodmares should be maintained at an optimal body condition (around 3/5 or 6/9 depending on the scale) during pregnancy, the researchers say. In the foals, maternal obesity was associated with enhanced insulin resistance, low-grade inflammation and the transient development of osteochondrosis lesions in foals. The low-grade inflammation may be a factor in the development of osteochondrosis, they said. “These may affect both physical and behavioural performances at adulthood, with particular importance in a species dedicated to sport and competition. They said maternal obesity during pregnancy should be avoided to protect foals. “Since we and others previously demonstrated that undernutrition during pregnancy also affects the development of foals, at least until 24 months of age, it is important to underline that maternal undernutrition should also be avoided. “In conclusion, gestational obesity could possibly induce insidious consequences on health, well-being and athletic performances of adult horses and subsequently putatively affect the whole equine industry.